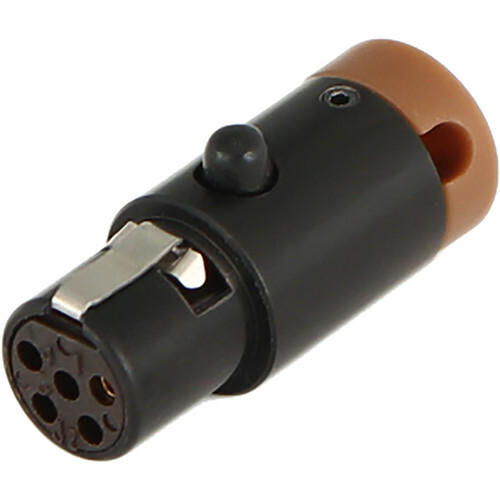 Featuring a distinguishing brown cap, the Cable Techniques CT-LPS-TA5-S is a female 5-pin mini XLR connector with a black shell and gold contacts. It has been constructed with an adjustable 90° cable-exit, allowing you to use the connector in left or right orientations. For further flexibility of use, the connector offers a cable outlet that's adjustable from 60 to 120° and from 240 to 300°. The CT-LPS-TA5-S accepts cables with diameters up to 3.0mm. The connector works with compatible Cable Techniques cables, as well as Mogami W2929 and Belden 1804A. Box Dimensions (LxWxH) 4.55 x 3.0 x 0.45"